Last summer, a few friends and I hosted a 24 hour Harry Potter Movie marathon. Yes, the same friends who co-hosted the Indiana Jones party and the James Bond Extravaganza. It was just as dorky – and just as much fun! – as it sounds. We watched all 8 movies in a weekend filled with snacks, games, costumes, and general goofiness. The only problem we have now is figuring out what we can do to top this crazy party. 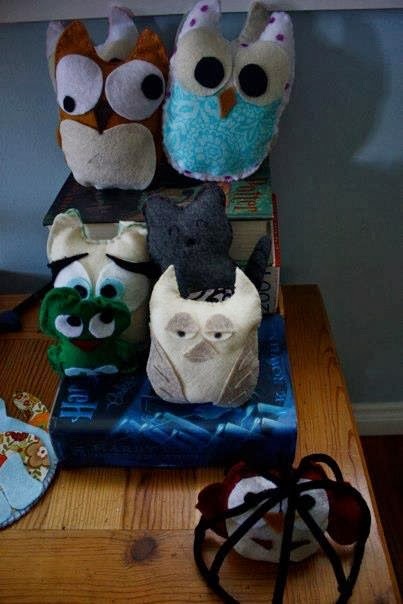 The guests came in costume and we had a number of activities – a triwizard tournament including apple bobbing and puzzeles, paper mache dragon eggs, patronus balloons, a magical felted critters, and, of course, elavorately relevant decorations. 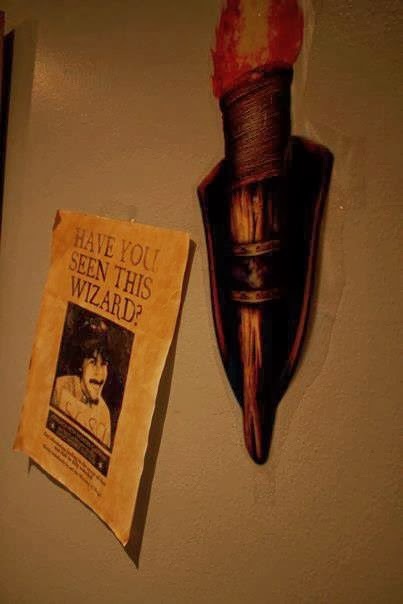 Think golden snitches hanging from the ceilings, Azkaban escapee posters on the walls for each guest, hanging (electric!) candles everywhere, and a dark castley vibe. The bathroom was super creepy with a homemade moaning myrtle CD and a giant picture of a troll. Each framed photograph in the house was replaced with pictures of knights and other mythical people and streamers in house colors decorated the ceiling. In the corner was a giant spider. I wish I had more pictures of the decorations – they really were fabulous. The patronus balloons were really fun – ahead of time, we blew up baloons and drew a magical creature on them in sharpie. We deflated the balloons before tossing them out to guests so that their patronus was a surprise when they blew them up (at the same time in the series that Harry was learning the patronus charm, of course). We had all sorts of coloring pages and puzzles (unscramble the words, crosswords, word search, make your own latin spells, etc) to keep the guests occupied at all times. Of course, I made plenty of magical snacks as treats. There aren’t any pics of them, but I also made chocolate frogs stuffed with peanut butter, marshmallow, or raspberry cream using chocolate molds. A Pensive Punch has swirls of luster dust shimmering and glittering with gem-shaped ice cubes and there was plenty of butterbeer to go around. 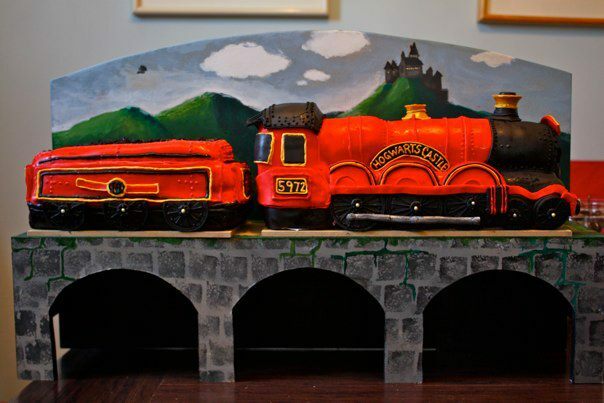 Let’s start with my favorite: an epic Hogwarts Express cake! My dad made the stand for me and my co-hosts painted it beautifully. I didn’t love the coal car, but the engine was awesome! 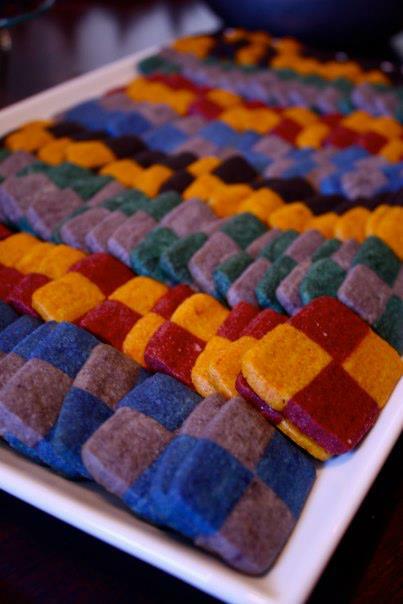 Checkerboard cookies for each house. 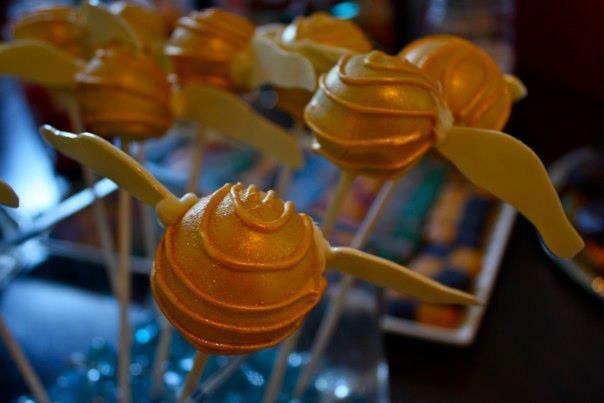 Golden snitch cake pops (I know I know, too much cake. 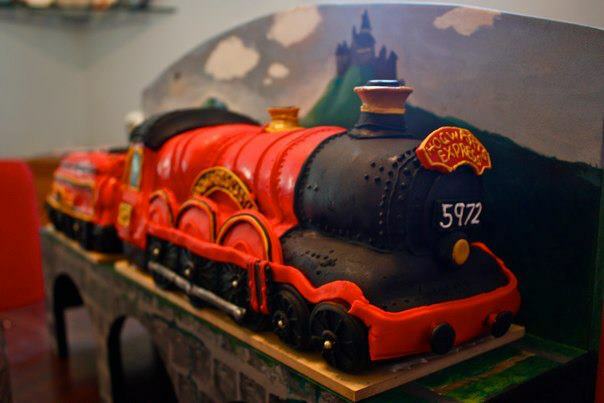 But I couldn’t let the scraps from the Hogwards Express cake go to waste). 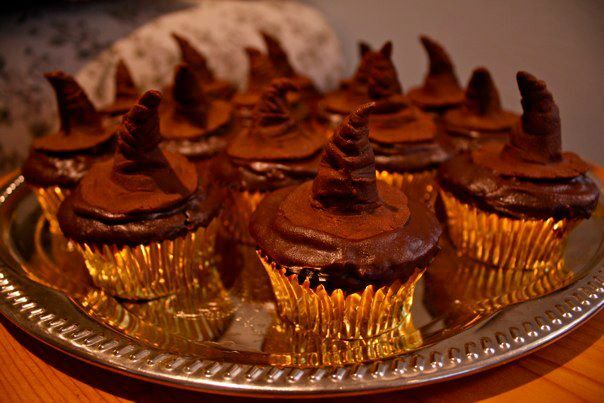 Sorting hat cupcakes. 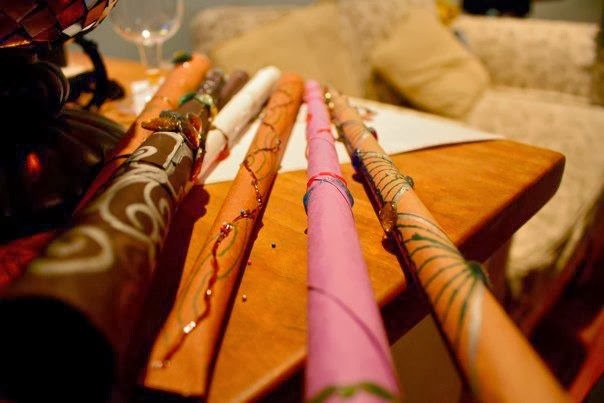 We used these to “sort” our guests into houses when they arrived. Each cupcake had cake/pastry cream filling in colors representing a house. The guests had to pick a cupcake, take a big bite, and reveal which house they were in! 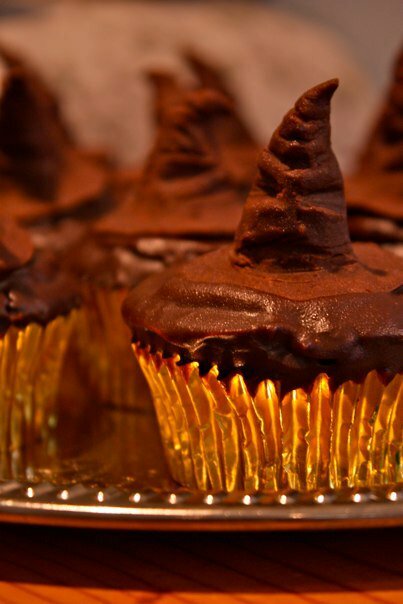 The sorting hat figurines on top were hand sculpted using homemade modeling chocolate. A royal pain, but I think it was worth it. Oh, and in case you’re wondering, I ditched my guests and went to bed around 3. All this baking can really wear a gal out!